Houston, Texas – September 22nd, 2015 – As part of its upgraded case modeling and reporting, LitCap announces the publishing of its Quality Assurance Group’s “Case Financing Report”. The LitCap Quality Assurance (“QA”) Group, is an internal underwriting and risk assessment group that uses the LitCap technology suite of analytical products to assess the risk and success profiles of cases. The QA Group reviews cases and dockets of cases listed on LitCap for case cost funding. The LitCap QA Group has compiled its review of two years and over 250 litigation financing notes funded, which represents over $250 million in case-related financing allocated on the platform. The review shows that LitCap’s lenders have had annual double-digit returns, while holding default rates below one percent. LitCap’s Quality Assurance Group provides reviews and reports to lenders that assess the risk of a LitCap attorney’s loan request. The LitCap QA Group evaluates cases listed on the platform and determines case credibility for a loan and associated risk or probability for default. 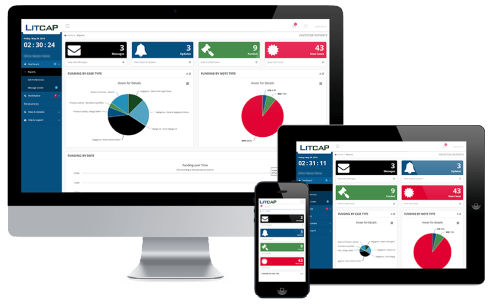 The LitCap QA Group uses the technological advantages of the LitCap platform, and a host of proprietary products that score the attorney, the law firm, the cases, and other relevant performance based data to produce concise accurate case analytics, executable in a quick, reliable, and efficient manner. LitCap offers institutional capital managers a portfolio of high yield returns which are uncorrelated to standard market dynamics. Additionally, LitCap controls the case financing via its online platform to offer a diverse and quality-driven portfolio of case types and sizes.